It was, therefore, exciting to recently meet a kindred spirit in J.M. Evenson whose new release, Shakespeare for Screenwriters, will continue to fuel the discussions about enduring plots and archetypes as well as that longstanding debate of whether he really, truly authored all those plays and sonnets himself. Q: Let’s start with some brief background on who you are and what you do. A: I am both a writer and a scholar. I received a Ph.D. in Renaissance literature from the University of Michigan and an M.F.A. from UCLA’s famed School of Theater, Film and Television. I’ve been a writer in LA for the last 5 years. As a screenwriter, I’ve worked with a variety of studios and production houses, from DreamWorks to Focus Features. In addition, I’ve kept up my scholarly work by teaching Shakespeare, composition, and film part-time at Pepperdine University in Malibu, California. This book is, in fact, a perfect meeting of both my most passionate interests. Q: How and when did you have the epiphany that a playwright who lived so long ago could impart creative wisdom to aspiring screenwriters in the 21st century? A: I remember it clearly. One day, after finishing up with my teaching at Pepperdine, I was trying to come up with ideas for a new story. I thought to myself: if only I could write like Shakespeare! And it dawned on me: if I spent some time analyzing his works to see how he did it, or what they might call “reverse engineering” his writing, perhaps I could learn a thing or two. The idea for this book was born that day — I knew I could not be the only person who could learn a thing or two from the greatest writer who ever lived! Q: Controversy continues to simmer among scholars regarding the true authorship of The Bard’s 37 plays and 154 sonnets. What’s your own position on the debate? A: I believe the debate is motivated by class politics. Edward de Vere, the man most often identified as the secret writer of Shakespeare, was a cultured aristocrat. Shakespeare was, by contrast, relatively low-born. In fact, the class difference is a main part of the argument: how could such a low-born person possess such unrivalled genius? In their minds, genius is the purview of those with money. This is an argument I simply do not buy. Q: In your book you make the point that Shakespeare is one of the greatest writers of all time. What do you believe is the secret to Will’s sustainability and modern-day popularity? A: I think Shakespeare’s unique creative genius transcends barriers of language, culture, time, and place. He never goes for the small story. Love, family, power, war — these are the issues Shakespeare addresses. His plays touch a nerve because they are raw, human, and utterly timeless. Q: What’s your favorite Shakespearean play? A: I love them all, but my personal favorite is “Hamlet.” I wish I could explain why this is in terms that made sense. I can’t. It just grips me tight and holds me from the first words until the end. It’s love! Q: What is your favorite Shakespearean speech or catch-phrase? A: I think probably the famed “to be, or not to be” speech from “Hamlet.” I’ve read the speech a thousand times — maybe more — but I find something new every time. Q: Numerous film adaptations have been made of Shakespeare’s work. Which one resonates the most with you? A: I actually love many of the adaptations. Some of them are excellent all around, such as Branagh’s “Much Ado,” which literally made me fall out of my chair laughing in the theatre; some are landmark films, such as Olivier’s “Hamlet”; some are of sentimental value, such as the Zeffirelli’s “Romeo and Juliet,” which was the first Shakespeare play I’d ever seen; some are of special interest, such as the ultra dark version of “Macbeth” directed by Polanski right after his pregnant wife’s murder by Manson. Each one offers new insight on these amazing stories. Q: Which do you think lend themselves better to screen adaptation – Shakespeare’s comedies or tragedies? A: There have been dozens of remarkable adaptations of both his comedies and tragedies. I think directors like Joss Whedon, with his fabulous recent version of “Much Ado,” prove that Shakespeare’s comedies are as timely today as they were 500 years ago. Kurosawa’s “Throne of Blood” shows that Shakespeare’s tragedies are powerful no matter which language they are filmed in. The history plays are also marvelous — Branagh’s “Henry V” is absolutely riveting, one of my top favorites. No matter what the genre, Shakespeare’s plays continue to speak to each new generation. It’s truly amazing. Q: Give us an example of a modern movie that demonstrates the writing principles you see in The Bard’s scripts? A: Let’s take an example from the most famous of all Shakespeare’s heroes: Hamlet. Far from a typical hero, Hamlet is actually best known for questions and doubt. He is a psychologically complex character — smart, introspective, angry, despondent, euphoric, and possibly insane. The key to building psychological complexity into your heroes is giving them an inner conflict. Watching a hero struggle with inner conflict generates sympathy and creates psychological depth that audiences recognize as uniquely human. For Hamlet, the struggle begins in the very first pages. He is visited by the Ghost of his father, who tells him that he was murdered by Claudius, the reigning king. His father’s Ghost demands that Hamlet kill Claudius in revenge. If Hamlet were a typical avenger, he would go do it. But Hamlet is a thinker. In a moment of pure anguish, Hamlet asks his famous question: “To be, or not to be? That is the question.” In this passage, we discover the true nature of Hamlet’s dilemma. Why do bad things happen to us? Is it better to die than to suffer? What happens to us after death? These are real questions — ones that humanity has struggled with since the dawn of time. The directive from the Ghost thrusts Hamlet into a moral quandary, and from that moment on, Hamlet is ripped apart by an agonizing internal conflict. Should he, or shouldn’t he, kill Claudius? Many screenwriting manuals will tell you to find a single motivation and make sure your hero stays on point. But what we learn from Shakespeare is that sometimes it’s better to not to limit your characters to one motivation. Let your characters struggle with their inner conflicts. Let them have flaws, and let them overcome. Above all, let them be human. Q: How does Shakespeare’s five-act structure correlate to what we’ve been hit over the head with in three-act structure? A: Here’s an interesting but little-known fact: there’s no such thing as a five-act structure for Shakespeare. The five-act structure is purely a construction of modern editing practices. If you look at the original works printed in the Renaissance, you will see that there aren’t divisions into acts or scenes. I do think there is something to be said about Shakespeare and structure, however. Shakespeare wasn’t beholden to formulas. Some of his plays obeyed the set-up, rising action, falling action model; some do not. “Othello,” for instance, rises in action to (what we call) Act 3, Scene 3, when Iago convinces him that Desdemona is cheating on him. This is the turning point of the play — not unlike, say, the turning point in “The Godfather,” when Michael embraces his family (and The Family) and kills Sollozzo. Other plays, like “King Lear,” are structured like an avalanche: the play begins at a high point, with Lear happily dividing his empire, but then immediately begins an inexorable march into shocking tragedy. It ends with Learn naked and insane, holding his beloved dead child, with his empire ruined and everything lost, before he dies. It’s an unusual structure now, and it was unusual in Shakespeare’s time. But Shakespeare was a maverick — he was then, and will always be, unique. Q: If you could take any of his plays that have never been adapted to the medium of film, which one would it be, how would you define the new context in order to appeal to mainstream audiences, and who’s your dream cast for it? A: Amazingly, there are no plays from Shakespeare that haven’t been committed to film. Some of the less well-known plays have not gotten the big release treatment from Hollywood, but all of them have been filmed at some point. The BBC has been diligent! Q: What’s the most important thing modern writers can learn from Will? A: I think a lot of writers these days are worried about making their ideas fit into standardized formulas. They give up on their voice and everything that makes them unique in the hopes of making it. I’d just remind them that Shakespeare was a maverick. Instead of adhering to formulas, Shakespeare made every single play exactly what it needed to be without worrying about whether or not it broke the rules. 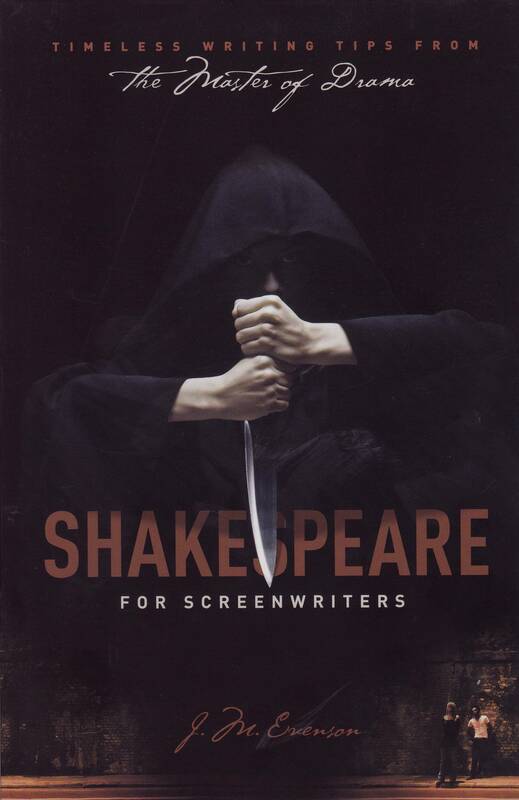 What Shakespeare ultimately teaches us is to do whatever it takes to make your story right. If you need to, break the rules of today — just as Shakespeare broke the rules of the sixteenth century. Q: Shakespearean plays were typically light on the number of female roles in the cast (primarily, of course, because those roles were played by males). In your view, which of his works could best be adapted to a film – regardless of setting or circa – in which the cast was comprised of a majority of females? A: I don’t necessarily believe that his works are light on female roles — or at least no more so than Hollywood today. In almost every play, there is a strong female character. In “Macbeth,” it’s Lady Macbeth; in “Lear,” it’s Cordelia; in “Antony and Cleopatra,” it’s Cleopatra. The list goes on. In some of the plays, the female characters steal the show, as is certainly the case with Lady Macbeth. Almost all of Shakespeare’s major female characters are fascinating in their own right, regardless of whether or not they are or were played by men or women! Q: Let’s say, hypothetically, you could sit down for lunch with the world’s most prolific playwright. Where would you go and what three questions would you most like to have answers to before that meal is over? My first inclination is to say that I would ask him detailed questions that have been bothering us for 500 years: Why does Hamlet delay? Why does Iago do it? What drives Macbeth? But the truth is that I like the fact that we don’t have solid answers to these questions. I like the fact that there are ambiguities in the way these characters were written. Every time I read Hamlet or Lear or Othello, I see something new. The characters seem to change and grow as I change and grow as a person. It’s like the Mona Lisa: if we could change her smile, would we? She’d lose part of her charm. Q: What’s your best advice to new writers who dream of making it big in Hollywood? A: I had a wonderful teacher at UCLA, Professor Howard Suber, who told me that the most important determining factor in how well a writer will do in Hollywood is not their talent or their networking skills; it’s how they handle despair. It sounds depressing at first, but the hard truth is that you will encounter setbacks in this town. Everyone does! You just have to learn how to handle it. The most important skill you can have in Hollywood is persistence — never, never, never give up! A: I have several projects in the hopper. First, I’m gearing up to teach an online class through ScreenwritingU on specific lessons that writers can learn from Shakespeare. Second, I’m finishing up a children’s book that I just wrote. Third, I’m almost done with the proposal for my next book on writing, about which I am very excited — stay tuned for that one! A: I just want to say how delighted I am to be doing this interview here with you! Many thanks!